“I think China’s manipulating their currency, absolutely,” President Trump said back in August. Yet the People’s Bank of China (PBoC) was, and has been, intervening to keep the RMB up, and not to push it down, as Trump was alleging. And we believe such interventions are about to get much larger. Here is why. 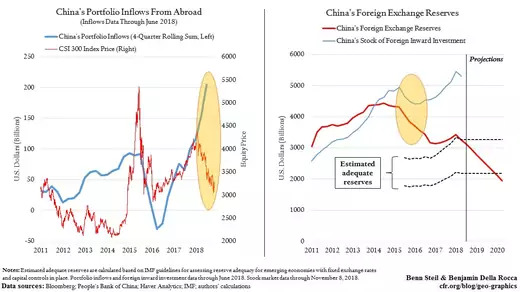 Over the past two years, as our left-hand figure above shows, foreign portfolio investors have piled prodigiously into Chinese assets, helping to support the RMB. But history suggests this trend is about to reverse. While inflows have been rising, Chinese stocks have been tumbling—they are down over 20 percent from their January peak. Dreadful performance like this typically drives funds out of emerging markets. We may be seeing the beginning of such outflows in China. Repatriation of liquid foreign capital will make it far more challenging for China to keep its currency up. Of course, China could change course and let it fall, but that risks exacerbating the foreign-debt burden of its highly leveraged corporates. It could raise interest rates, but that would further slow a slowing economy. It could, to keep capital at home, demand higher returns on its foreign lending, but that would mean sacrificing its efforts to subsidize its companies operating abroad, as well those aimed at putting dollars to the service of geostrategic objectives—like Belt and Road. In short, then, there is every reason to expect that the PBoC will boost its support for the RMB by selling dollar reserves. This is what it did back in 2015, when a plunging stock market scared away foreign capital. So in spite of President’s Trump’s repeated charges that China is manipulating its currency for competitive advantage in trade, all evidence suggests that it will continue to do the opposite. But if China were to sell reserves at the same pace as in 2015, its reserve levels would, by mid-2020, actually fall below the safety threshold implied by the IMF’s framework for reserve adequacy—as shown in the right-hand figure above. The prospect of a balance-of-payments crisis, in which China would struggle to pay for imports and service foreign debt (a prospect considered outlandish a decade ago), highlights the urgency with which China must begin addressing the problem of high and rising corporate and local-government debt levels. The PBoC has no easy fix for these problems.